Backwater Angler is now located 3/10ths of a mile off of Exit 27 at I-83 at 107 Mt. Carmel RD Parkton, MD 21120. If you find yourself in the old shop parking lot this weekend just take a left out of the old lot, take a left at the light at Mt. Carmel Rd. and a left into the Village Plaza. Easy! If you find yourself in the old shop parking lot this weekend just take a left out of the old lot, take a left at the light at Mt. Carmel Rd. and a left into the Village Plaza. Easy! Coming from somewhere else? Please give our directions to Backwater Angler a look. Tiles courtesy of MapQuest http://www.mapquest.com/ Thanks to Mapquest for giving us birds-eye view of all of that green space in the Hereford Area of Gunpowder State Park! This entry was posted in news on July 29, 2016 by Theaux Le Gardeur. After a brief spell of 80 cfs flows the dam has reduced the flow to the mid 30’s yesterday morning. Long leaders and small dry flies have been still been tempting plenty of fish in the faster water. Small caddis patterns and ants (size 18) are great go-to flies all day long. This entry was posted in fishing report on July 24, 2016 by Theaux Le Gardeur. Backwater Angler is moving. Thanks to Staffers Justin Gaffney and Gene Howson for all of their heavy lifting this week. Help us lighten the load by stopping in this Saturday and Sunday and getting great deals on (in-stock only) Fly Fishing Gear for the Mid-Atlantic. Pick three Loon Products and get the lowest priced one for free. Baker’s dozen flies-buy 12 get 1 free. Free casting lesson ($75 value) with any Rod Purchase (must book in-advance). 50% off table for things we simply cannot move!!! Thank for your support in our 16th year. This entry was posted in news on July 22, 2016 by Theaux Le Gardeur. 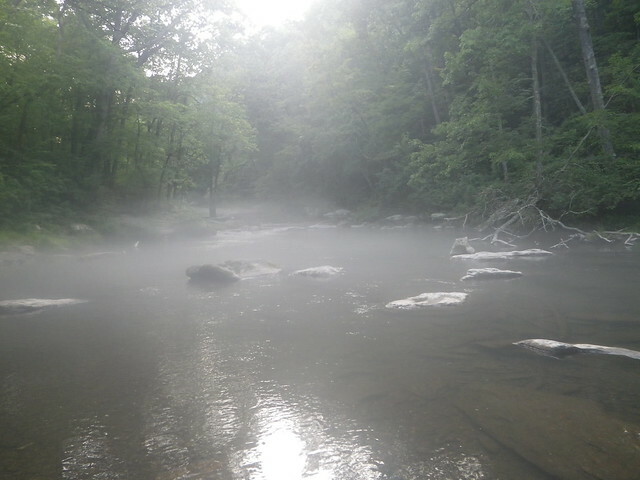 The Gunpowder River is clear upstream of Bluemount road, flowing at an ideal 78 CFs and is 55 degrees. Fish are taking terrestrials, small streamers and midge patterns. 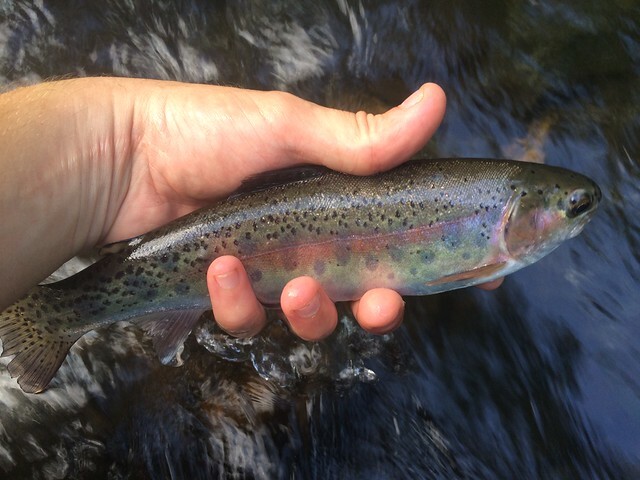 Five-thousand (5,000) fingerling rainbows were stocked in the upper catch and release section in the past two weeks. Since Friday, the flow has been bumped up from the mid 40’s to the 80 cfs mark, providing much greater fishing opportunities. The water temperature in the upper sections ranging from 50-55 through the day. 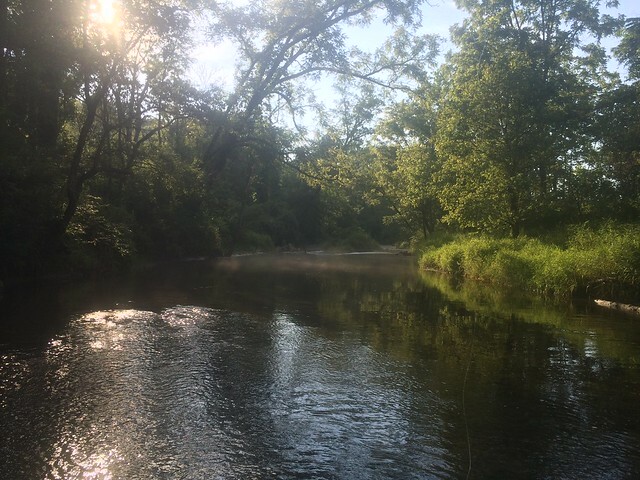 At time of year, with temperatures being well in the 90’s, its often best to give the lower sections a miss due to high water temperature and lots of river traffic from others enjoying the river. The fishing is most consistent in the morning. Bigger fish are falling readily for an opportunistic hopper or beetle. 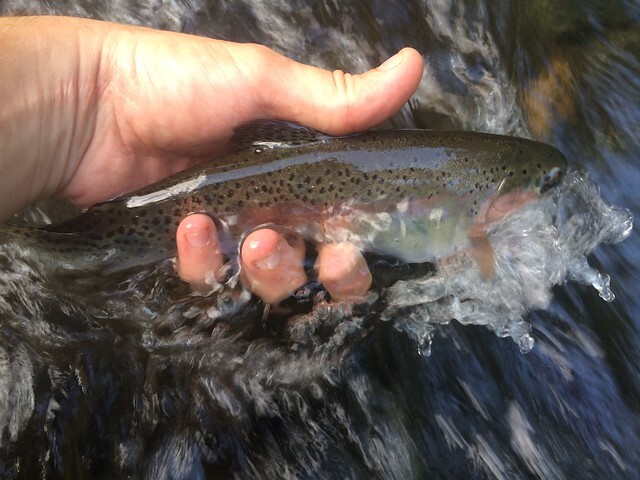 I’ve been catching more rainbows than usual lately, including a large one which was 17 inches long. Many fish will be tempted by caddis (size 16-18) and midges. I like using small streamers like sculpin patterns, wooley buggers and traditional’s like grey ghosts and Mickey Finns, being effective when fished up against any structure. As we enter August, keep an eye out for tricos as well in the morning. This entry was posted in fishing report on July 21, 2016 by Theaux Le Gardeur. Please join us for a fly fishing school. On Sunday, July 17th, a Backwater Angler Guide will be teaching a fly fishing school that is ideal for beginners. If you’re planning on fly fishing in Maryland, or anywhere else for that matter, this course is a great introduction to the sport. The school covers knots, casting, gear and fly selection. Class is held from 9:00 AM till 12:00 AM. Cost is $125 per person and includes the use of gear. A Maryland non-tidal fishing license and trout stamp is required and may be purchased at the shop with check or cash the day of the school. Class size is limited to 4 and pre-registration is required. Please give us a call at 410-357-9557 to pre-register. This entry was posted in events on July 16, 2016 by Theaux Le Gardeur. Please join us for a fly fishing school. On Sunday, July 10th, a Backwater Angler Guide will be teaching a fly fishing school that is ideal for beginners. If you’re planning on fly fishing in Maryland, or anywhere else for that matter, this course is a great introduction to the sport. The school covers knots, casting, gear and fly selection. Class is held from 8:00 AM till 11:00 AM. Cost is $125 per person and includes the use of gear. A Maryland non-tidal fishing license and trout stamp is required and may be purchased at the shop with check or cash the day of the school. Class size is limited to 4 and pre-registration is required. Please give us a call at 410-357-9557 to pre-register. This entry was posted in events on July 7, 2016 by Theaux Le Gardeur. 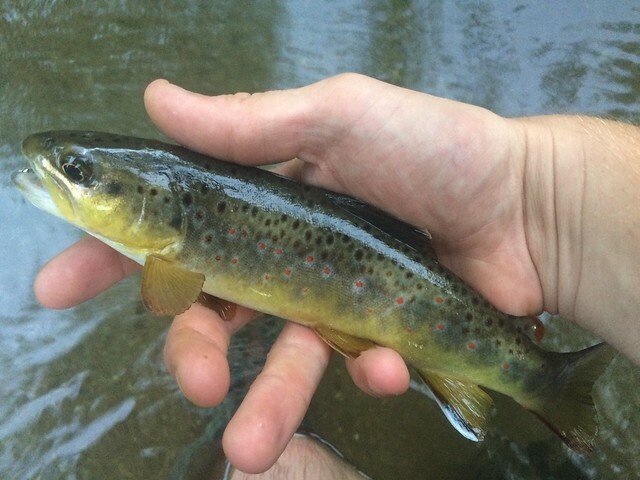 The river is shallow, clear with ideal water temperatures for trout fishing.Terrestrials are having opportunistic fish looking up to the surface for ants, hoppers and beetles and will take them along shady banks. Midges will catch fish. Using a small zebra midge behind a caddis pattern is a good bet in the catch and release section-particuarly above falls Rd. The low water levels have forced fish to the deeper pools, and sight fishing with a pair of good polarized lens sunglasses is an effective way to catch fish. You’ll be able to see fish and know where they are for next time. Please note: The shop will be closed on Monday, July 4! This entry was posted in fishing report on July 3, 2016 by Theaux Le Gardeur.